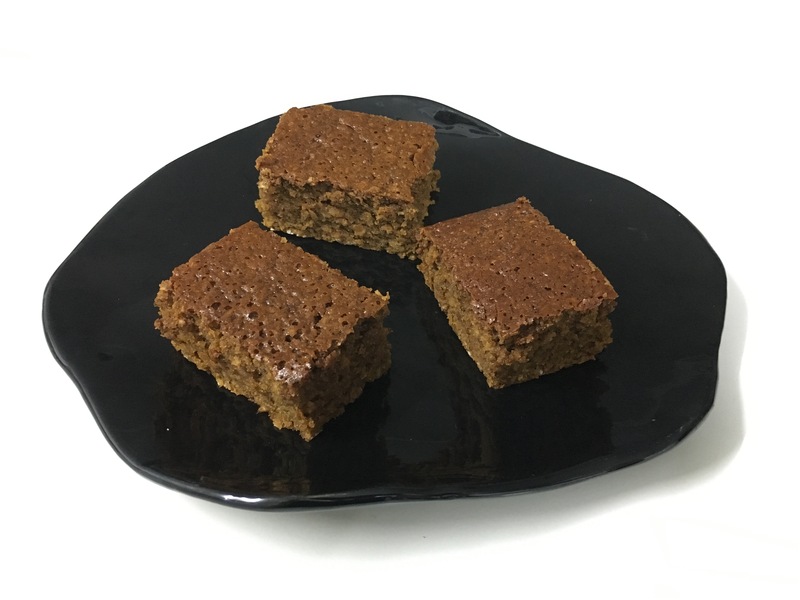 Pumpkin parkin is a variation on Yorkshire parkin, a sticky slice that is normally allowed to stand for a week before cutting, to soften the texture and allow the flavour to develop. By adding mashed pumpkin and replacing the traditional rolled oats with finer Scottish oatmeal, this recipe yields a delicious gingerbread-like slice that can be eaten straight away. You can buy Scottish oatmeal online on this site, put rolled oats through a food processor to blend them a little finer, or simply enjoy a coarser texture in the final product. You can also vary the spice mixture, or replace molasses with an equal weight of golden syrup if you prefer a lighter flavour. Preheat oven to 140 °C (convection, not fan-forced). Grease a 25 cm square baking tin and line with baking paper. In a saucepan, warm butter, sugar, golden syrup and molasses over low heat until the butter has just melted, then remove from heat and stir together to form a thick paste. Allow butter mixture to cool slightly. Beat eggs and milk together. In a large mixing bowl, combine oatmeal, flour, baking powder, salt and spices, then gradually fold in butter mixture, beaten eggs and pumpkin. Mix to give a smooth batter, then pour into prepared tin. Bake 90 min until golden-brown, then remove from oven and allow to cool 20 min before cutting.